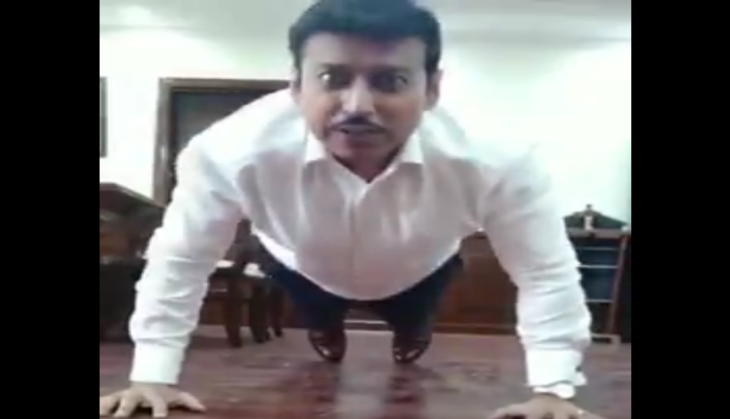 Rajyavardhan Singh Rathore, newly elected Information and Broadcasting minister drops to the floor of his office and without taking a single pause he does push-ups. The union minister shares his fitness challenge video on his Twitter account. The Olympian and the union minister also challenges Indian cricket team skipper Virat Kohli, actor Hrithik Roshan and badminton player Saina Nehwal to join in the fitness challenge. Mr Rathore started the video by showering compliments and praising Prime Minister Narendra Modi, who is known for his long hours at work and his love for yoga to stay fit. The minister called PM Modi an inspiration, praising his ability to fight a hectic schedule "effortlessly". The ex-armyman does 10 push-ups - without puffing or grunting - dressed in his work clothes, as part of the #HumFitTohIndiaFit campaign. Mr Rathore is Union Minister for Youth Affairs and Sports. The Olympic medalist and fitness freak posted the video to urge everyone to shoot a video of their "fitness mantra" and share it. Mr Rathore had also monitored the Khelo India School launch that promotes sports among the students across the schools. The programme provides a scholarship of Rs. 5 lakh each year to 1,000 athletes for a period of eight years.